Malida, Sweetened Poha Breakfast Cereal or Ceremonial Offering?! I was agonizing over what my first post of 2011 should be?! I could have posted about my victory over macaron. These elusive, as I once thought glorified meringue, would be a perfect subject matter. I was doubly challenged, as I needed to replace the almonds with another pantry ingredient. The sheer challenge is fascinating but macarons are French, or better yet Italian origin, and my ancestral roots are in the East. I will give you an account of my, at first unsynchronized, attempt and how I, slowly got into a seamless, rhythm of the macaron some other time. I have images burnt in my mind from childhood, some are memories of real events, and some are memories of dreams I had at a very young age. I knew the first post of 2011 should be a glimpse of a food with a story that was an integral part of me and illustrates the essence of being Indian and Jewish. Often I am asked what Indian Jewish food is, and often I answer taking regional dishes and ingredients and tailor fit them to the Jewish dietary laws. Tweaking them or creating from locally sourced and available ingredients your own new dishes based on your own religious, cultural traditions, rituals and needs, while respecting and trying not to offend the local customs and beliefs. A fusion of sorts. ﻿﻿﻿﻿﻿﻿Growing up in Israel, in a predominantly Marathi speaking Indian Jewish community, I knew of three Indian Jewish communities who were separate and distinct from each other. You can read a brief summary here. Later on two more Indian Jewish communities were discovered in India. Our community, the Bnai Israel (sons of Israel), descendants of one of the lost tribes of Israel, was the largest and believed to be shipwrecked at their eventual destination on the Konkan coast just south of Bombay in Maharashtra. Believed to have arrived in India before the destruction of the Second Temple in Jerusalem (70AD). Legend has it that the prophet Elijah helped the small group washed onto the shores, known as the 'Shenwar Telis', oil pressers, who did not work on the sabbath, practiced circumcisions and recited the Shema. They lived in peace with their Muslim neighbors and never suffered persecution as a minority in a majority Hindu India. Later on many moved from the villages on the Konkan Coast to Bombay. As the Bnai Israel population became urbanized they rose high in the ranks of military, government, film, poets and scholars. Majority of Indian Jews about 60,000 immigrated to Israel and only about 5,000 Bnai Israel are left mostly in Bombay. ﻿ Left with only the knowledge of the five books of the bible, and mostly isolated from any news of developments out in the spiritual Jewish world, the Bnai Israel continued the traditions and oral history carried from generation to generation. The Siddur, prayer book, was a transliteration, Hebrew written in Hindi characters. When we got married in Israel at an Indian synagogue, a Siddur was given to Jonathan to follow the services, only thing it was written in Hindi characters. He couldn't follow the happening at his own wedding although he embraced the entire experience and culture way before I embraced the Indian in me. ﻿ ﻿﻿﻿﻿﻿There were many parallels between Indian and Jewish traditions. A central ritual for both communities was offerings, In Hinduism to many gods and in Judaism the offerings brought during the pilgrimage to the Temple in Jerusalem. To the best of my knowledge and experience with many different Jewish communities from diverse ethnic backgrounds in Israel and in the United States, to this day, the Bnai Israel community is the only one carrying on that tradition. The offering was the Malida. Consequently the dish and the ritual were called interchangeably Malida. If there is a dish that defines Indian Jewish cooking it would be the Malida! The dish is made of parched, flattened thin rice flakes, called Poha, sweetened. Coconut, cardamon and blanched and thinly sliced almonds and pistachios added to the sweetened Malida and piled on a thali with five fruits and vegetables (dates, bananas, oranges, apples or any other fruit in season), to pray over what god has given us from the ground and from the tree. Malida is celebrated mostly on a joyous occasion, at a bris (circumcision ceremony), engagement, a henna ceremony (which in Israel is not the actual wedding but celebrated a day or few days before the Jewish wedding), a house warming party and a graduation. Once in awhile when times are bad and you are down on your luck or you encounter sickness in the family we celebrate with a Malida ceremony to turn the tide. Usually the woman would vow to fast and once it is fulfilled we celebrate with a Malida ceremony to mark the accomplishment. If were a happy occasion we use rose buds as spices and perfume to put at the center of the Malida thali but if it's a sad one we used cloves. Elijah the Prophet is central during the ceremony there is a prayer, a chant some say a hymn we recite for Elijah the Prophet during the Malida Ceremony. Elijah the Prophet was fundamental to Bnai Israel core Jewish beliefs and identity. This is me one of handful photos (salvaged) I have of my childhood. 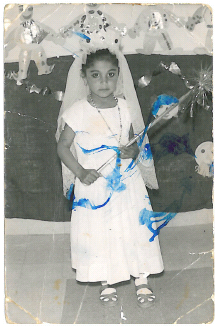 Dressed up as Queen Ester for Purim I was a preschooler about 4-5 years of age. ﻿﻿﻿﻿﻿﻿ Imagine me wide eyed little Indian girl experiencing all these life cycles with a thread of Malida is as a common denominator, often at the cramped quarters of our apartment or my grandmother's place, or a neighbor's, with twenty to fourty people at the time, blankets are all spread on the floor and some pillows propped. at least ten adult (13 bar mitzvah age and older) men including the Hazan (cantor) as a Minyan*, as the Bnai Israel community didn't have any trained rabbis, conducting the Malida with the men at the living room and the women in the kitchen, bedrooms and porch and many kids running in and out to make for a great commotion. The Malida is served after all the blessings and a full Indian meal of curry and rice is served shortly thereafter! There was sometimes drama! Many non Jewish Indians I met over the years had Poha as a savory not a sweet dish. I believe a sweetened poha dish (the Malida) is a distinctly southern Indian specialty, similar to a morning cereal. At a Challah and Chutney, cooking Demonstration and Tastings, I was invited to host at Sixth and I Historic synagogue in DC, The audience of 60 or so was not necessarily all Jewish. I would estimate half was Jewish and half was not, but few in the crowd were Indians, after all they did grow up with the food I grew up on or a version of it, and they potentially could be my biggest critics. As it turns out they were gracious, complimentary of all the dishes they tasted, and in fact were surprised as they never seen a sweet poha dish only a savory. Many thanks to my friend An @bakerstreet29 with the help as I was writing this post! Poha can be found in your local Indian grocery store or online here. Note: I make the dish at home and serve it at tasting without nuts and edemame to rave reviews. Also keep in mind these are suggested measurements, if you like it sweeter add sugar, feel free to adjust measurements to your taste. Immerse Poha in cold water for four minutes until softens. Keep in mind some like it al dente, crunchy, I don't! Be sure not to over soak and turn mushy and flake will lose its silhouette. Run through a sieve to drain all water out and press on top lightly to rid of excess water. In a large bowl, add the drained Poha and sugar and flake with a fork or with your fingers to fluff the mixture. Note Add the sugar immediately so it will blend in and not stay grainy. Add the cardamon and coconut and mix well. Note: I only use my hands or a fork to keep the integrity of the shape of the flake. Garnish with nut, edemame and golden raisins. Keep refrigerated until serving. Can keep in refrigerator for a few days. *Minyan: Ten adult (after Bar Mitzvah age 13) males needed to proceed with prayers. Reform and some conservative movements count women. I really want to do more Indian cooking this year. That's one of my big goals of 2011. Shulie, what a wonderful post! We have something similar to poha, and we call it "pinipig" used in desserts and often pandan scented. I always enjoy cultural passages in your posts. Please keep them coming. Absolutely fascinating. Thank you so much for sharing your memories. Fascinating post, Shulie. I want to know more! And I want to make this! Wonderful background info. I learned a lot. The photo of you as a young queen is really adorable! Wow great post. Loved reading about your background. And enjoyed the old photos! What a great post Shulie! Its amazing how much history we all carry with ourselves and after living away from home and family I've learnt how important it is to embrace your traditions and culture. You had told me about your upbringing and your culture but it was so fascinating to read about it in such a detailed manner. Thank you Rebecca, Brian, Annapet, @chesapbeets, Renee, Nisrine, Karen and Prerna for stopping by and reading this entry.I am happy you enjoyed it!! More stories to come in the future:). Shulie, what a lovely post! You are such a great story teller! I loved reading about the history of different cultures and religions intermingling! I especially loved your childhood princess pic! Adorable! I have never heard of Malida and Poha..I would love to try and make it sometime!Looks great! Wow, what an informative well written post. A culture I truly knew nothing of. I was really excited to read about Malida because Bohra's make them too specifically for religious occasions. Fascinating Kulsum!! Funny you should mention Yemen. A British researcher did a DNA testing and found Jewish Indian common denominators with some Africa and Yemen, which traces their travel route through DNA. Going to read your post now. I read in a book that some other communities in India (The Bnai Israel neighbors) have Malidas too, but was very brief mention and I assumed it was same exact dish. Amazing are the parallels drawn!! I promised I'll be back to add what I said on Twitter, "I love how you weave cultural/historical/religious touches into your posts with food as common thread." And Little Kali is ADORABLE! And love the new site, everything is so sharp and clean, looks great! Thx Annapet loved it when I saw it on Twitter!! :) Thx Ethan & Alison, mean a lot!! Good to know about flattened rice! I first thought it was like ketan kelapa (glutinous rice with coconut flakes). Looking yummy, Shulie! Oh shulie! what a lovely lovely post! and a great first post for the year. love your childhood picture. so adorable. Absolutely beautifully written post! You never cease to amaze me!! Thanks Pepy, An, Mdivani,Jean and Megan for stopping by and your kind words. Love your new blog look. LOVE your recipes and adore this one! That photo of you as a child is incredible! Tweet me where I can find cardomon pods b/c I want to make this! One of my favorites of all your posts Shulie. Indian Jewish food - wow that is a interesting twist. This breakfast is a great way to kick off the new year! Shul's, that was thee perfect first post. I found my grandparent's colonial numbers when I went back to Durban. With the celebration of Indin people being part of South Africa for 150 years we spoke a lot about wher ethe families came from. I left feeling deeply satisfied because I knew a little something new about how I fit into the world. OMG, I got so excited about your post I forgot to comment. Thank you for sharing your culture with us. I love reading your stories and the wonderful recipes that comes along with them. Shulie, this is utterly fascinating! As I've said before, I have long been fascinated by the Indian Jewish community and no one has explained it better than you have done now. What a marvelous history. Thank you for sharing such an intimate part of your history and a wonderful dish! Shulie: thank for opening your "door", I loved reading about your upgringing: such intimate stories and feelings of "home". Poha sounds wonderfully aromatic with cardamom pods. Your site is lovely.